My first hero died today at the age of 82. As a little boy, all I ever wanted to be was an astronaut. I ravenously devoured every detail of every Apollo mission from Apollo 7 (the first manned mission) onward. When Apollo 8 orbited the moon at Christmastime, 1968, it was then -- and still is now -- one of the greatest thrills of my life and an uplifting end to an awful, awful year. I followed the docking mission of Apollo 9 and the oh-so-close orbit of Apollo 10, running home from school on many of those days to absorb as much of the dazzling story unfolding on my television as I could manage. And then came the summer of 1969. 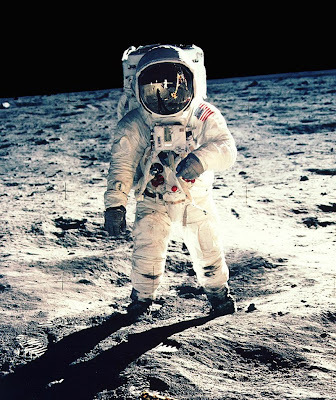 "'Men Walk On Moon' - The only positive event in the last 50 yrs for which everyone remembers where they were when it happened." As luck would have it, we were to be in the States that July, renting a cottage in Old Orchard Beach, Maine, for a couple of weeks beginning on the 19th. There was no television in that cottage, but fortunately my aunt and uncle and their daughters had rented another place not far from us with a tiny black and white t.v. in the living room. 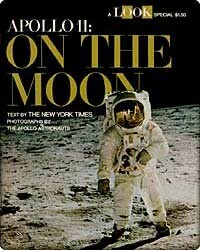 We were still in Toronto for the liftoff, on July 16, and I was glued to the television for much of that morning. The launch itself took place at 9:32 a.m. EDT, but I was watching hours earlier as Walter Cronkite described the mission particulars at great length. I simply could not get enough of that sort of thing back then. I followed the mission as best I could over the next day or so and then I was in a kind of "radio silence" as my family made the long trip to Maine by car. I picked up reports in dribs and drabs via whatever source was nearby until the afternoon of the 20th when we dropped in on my cousins to watch the actual landing. 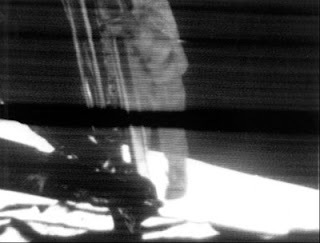 I was enraptured by the fuzzy, indecipherable pictures emanating from that tiny television, blissfully unaware as a young lad just how close that lunar module was to running out of fuel and crash-landing in a field of boulders. Only years later did I learn the true, incredible story of Neil Armstrong's decision to override the computer and steer that craft to its successful touchdown with about 30-40 seconds of fuel to spare, possibly the single greatest feat of aeronautics in history. I knew none of that back then, staring at the screen and trying to determine what, exactly, I was looking that. 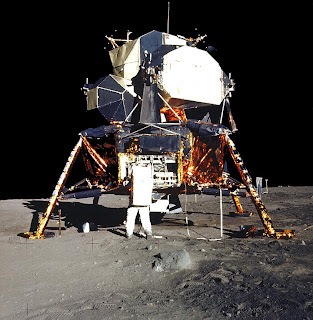 I only knew they had landed safely because Neil Armstrong told us so: "Houston....Tranquility Base here....the Eagle has landed." I will never, ever forget those words. They actually had a more profound effect on me than the more famous phrase Armstrong uttered a few hours later, because they were the first words ever issued by a human from the surface of another heavenly body, and because they made the ordinarily unflappable Walter Cronkite cry. Something else that sticks with me from that day: I don't recall anyone else in the room with me as I watched this incredibly momentous event. It may well be that I was so involved with what was unfolding that I blocked everything else out; however, I know I was sitting mere feet from the t.v. when it happened and, had the room been full, I almost certainly would not have had such a place of honour. "Apollo 11, July 1969. No other act of human exploration ever laid a plaque saying 'We Come In Peace For All Mankind.'" I don't remember much of the rest of that night; I don't remember much of the rest of that mission. I'm not even sure I saw the splashdown live on tv, although it does feel like I did. In the days and weeks that followed I collected all of the magazines and newspaper accounts I could get my hands on, badgering my parents until they bought me copies of LOOK and Life and spending hours poring over the accounts of the mission in the Toronto Daily Star (which I begged my folks not to suspend delivery of while we were away) when we returned home in early August. Sadly, those clippings and magazines are lost to time, yet they live on still in my memory, some of those accounts as fresh as if I had just read them yesterday. I was hopelessly in love with the space program and all that it meant for humanity in the future. The heady successes of NASA at the end of the 1960s were fodder for all of us dreamers; surely to goodness this was merely the beginning. I was too young, at eight years old, to possibly comprehend that this was the culmination of a contest with our cold war nemesis, the Soviet Union, and not the launching pad for far grander things. 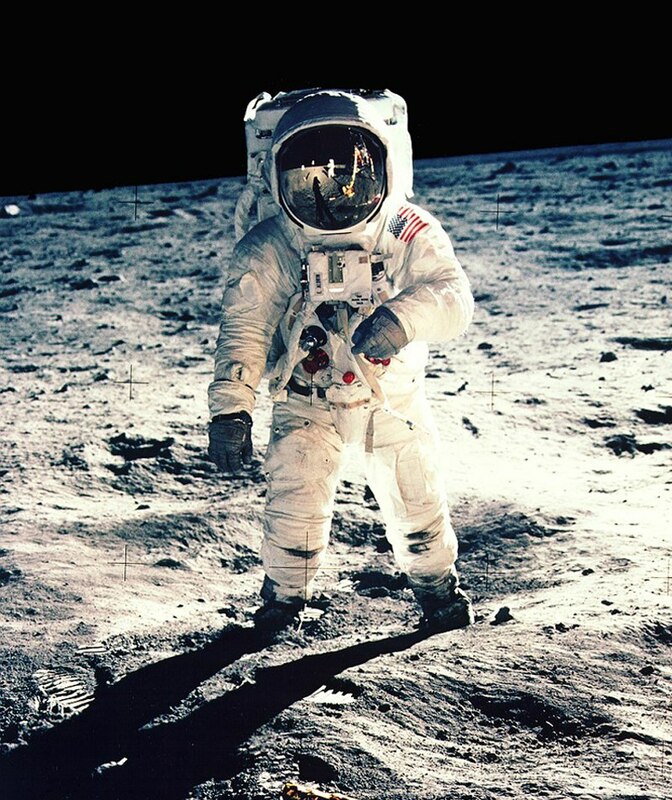 All I wanted to be was an astronaut, because they were surely the greatest men on this planet. Sadly, it was not to be: neither for me nor the seemingly inevitable future of humans visiting other celestial bodies. We returned to the moon successfully five more times only (and one very famous unsuccessful attempt) and each landing became less and less important to the global theatre. I never really got into the Shuttle Program; I think it was a combination of bitterness that they had allowed the missions to the moon to simply fade away and the loss of my starry-eyed wonder as I reached adolescence and adulthood. However, my childhood dream of being an astronaut never truly disappeared and I feel stirrings of it within me from time to time, especially on a day such as this when I am brought -- albeit jarringly -- back to the days of Apollo. 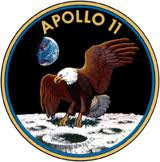 I don't know whether my infatuation with, and connection to, the moon began with the Apollo Program or was inherent in me from birth; it's a bit of a "chicken and egg" conundrum. I do know that I have spent many nights of my life just sitting outside, staring up at the moon and remembering that night in 1969, the night that everything -- anything -- seemed more than possible: it seemed probable. I knew this day would come, the day we lost Neil Armstrong (as we have already lost three others of the twelve men to have walked on the moon), but when it happened, today, it hit me harder than I really expected it to. 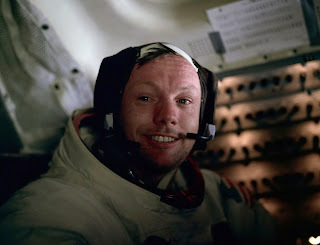 "Neil A. Armstrong 1930-2012. Farewell my friend. And now, perhaps more than ever, I bid you godspeed." R.I.P. Neil Alden Armstrong. You were my first hero. Thank you for everything. * All italicized block quotes appearing above are from Neil deGrasse Tyson and appeared in his Twitter feed today.